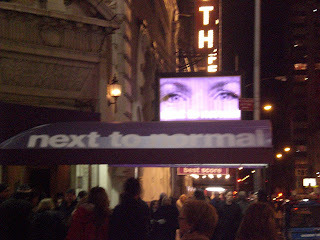 After dinner, we headed over to the Booth to see Next to Normal. Now, I've done a few theatre reviews in the past (one even appeared in an FSU publication), and what I'm about to say is no comparison, so please don't think of it as a true critique. We both liked the show, although we agreed it was depressing and kinda pointless. I liked the music much more than Jonathan did, but we had the same favorite number, "I'm Alive." Of course I didn't film this, it's from the official website. I'd love to recommend the entire soundtrack, actually. 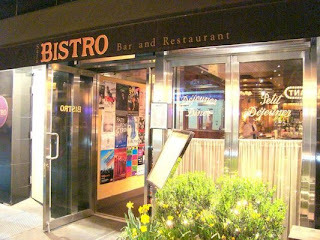 As many others would as well, since the show did win the Tony for Best Original Score in 2009. I don't want to give away any spoilers (there are quite a few, really), but I will say that I enjoyed all of the performances. I was a little sad that I didn't really enjoy Alice Ripley's voice in person as much as I do on the soundtrack... which is strange since she won a Tony for this very role last year. We did meet her though (and most of the main actors - we have their autographs on our playbills! ), and she's a joy. I was very impressed with the set and the lighting, and the more I think back, the more genius I thought went into the design. It was three levels, which really allowed those in the balcony to have a great view, much better than some other shows. Which is handy, since I decided to buy the cheapest seats available for this production (this was after much deliberation, but we now have a list of shows to see and a budget to follow, so I'm saving the big bucks for when we see Wicked, for instance). The only negative thing I have to say about the Booth is that the very last row (H) is extremely warm. The radiators are just behind the seats, so we were boiling by intermission. After the show we went around to the side of the building to wait and greet the actors. It was very special to thank them for a wonderful performance. I'm not really sure how common of a practice this is (although it also happens with Memphis since we saw the crowds down the alley, haha), but I'd recommend the chance to shake hands, hug, talk to, and get autographs (and sometimes photos!) with the performers. It would have been neat to have this opportunity with the pit as well (there is definitely some great work done by the musicians and conductor in this show). Anyway, it was a great Broadway experience, and I'd recommend the show to theatre folk and others well-versed in "new musicals," but perhaps not the general public, as it isn't Rodgers and Hammerstein.